Both butternut and spaghetti squash are winter varieties of squash with a firm rind and flavorful flesh. While both are low in calories and fat, and can make good additions to a healthy diet, they offer different proportions of nutrients. The flesh of spaghetti squash is very different from butternut squash — you don't want to use them interchangeably in recipes. Butternut squash is shaped like a bell, generally weighs from 2 to 4 pounds and is up to 1 foot long. The rind is a yellow to tan color, while the inner flesh is orange with a firm texture that softens as it cooks. 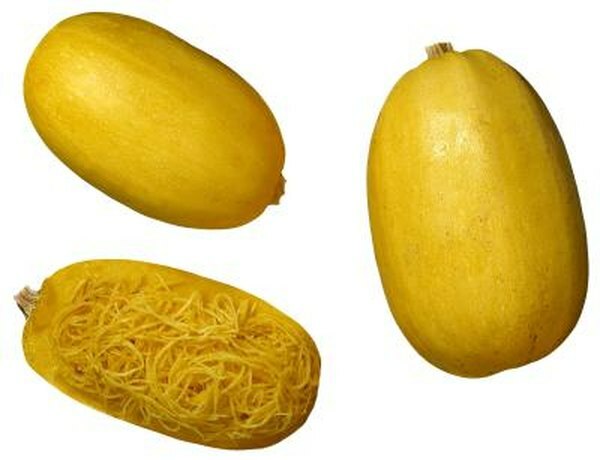 Spaghetti squash is a vibrant yellow color and oval in shape. It is a little less than 1 foot long and usually weighs from 2 to 3 pounds. The inner flesh is pale yellow and easily separates into spaghetti-like strands when cooked. Butternut squash contains 82 calories per 1-cup serving, with less than 1 gram of fat and no cholesterol. Spaghetti squash is lower in calories than butternut, with 42 calories per cup. Butternut squash has a nutritional advantage over spaghetti squash when it comes to fiber content. It boasts 6.6 grams of dietary fiber -- 26 percent of your daily value, an intake recommendation -- per serving, compared to spaghetti squash's 2.2 grams. Both types of squash contain almost no protein -- 2 grams per cup of butternut squash and 1 gram per cup of spaghetti squash -- and virtually no fat. Baking whole spaghetti squash takes about an hour, but if you cut it in half, scoop out the seeds and place it flesh-side down in a pan to bake, it will cook a little more quickly. If you have a pot the cut pieces will fit in, put them in with the flesh side down and add enough water to come halfway up the side of the squash and boil until tender. When spaghetti squash is cooked, draw a fork all the way through several times to separate the strands. Cooking butternut squash is much simpler than most winter squashes because the rind is thin enough to peel. Quarter the squash and scoop out the seeds from the lower half. Peel the pieces of squash, cut into smaller pieces, then roast, steam, braise or add to a stew. You can also cut the squash in half, scoop out the seeds and bake in the oven.